Here's a picture of how I have set my scopes up to do photomicrography with a digital SLR (Canon 10D). It's pretty near identical to the way it's been done for years with film SLR's. The camera is mounted on a stand above the microscope, with no physical contact between camera and microscope. I've put together a "personal web page" that describes most of my set-up. It's still pretty basic, but has much more info than I could put in a message. Hi Charlie, this is excellent - I intend to spend a bit of time studying the website, I think I might just learn a bit. Interesting Charlie. You have given me a few ideas here and on you web page. Thanks. This is terrific I so very much enjoyed your article, too. Looking at your setups here, this is exactly how I originally had my film camera set up on my microscope. I may go back to my film camera temporarily to photograph fast moving critters. Let me ask this, Charlie. Does your setup stay parfocal when you change to different power projection lenses or do you need to set each projection lens seperately? Someday, I should take the plunge into high-end objectives, but for now, simple phase objectives do the trick. I never looked through a microscope in K-12, and my whole experience was gained at home with a cheapo microscope for Christmas. Kids nowadays hardly ever want this kind of stuff -- they want another game for xbox. I wonder if anyone gets seriously into this hobby later in life if they didn't have this childhood experience? I've actually never assumed it would stay the same when switching to another photo-eyepiece, so I never even checked! 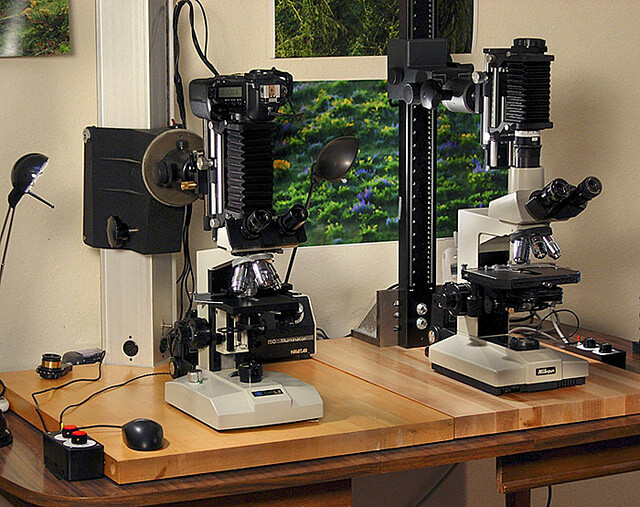 Any time I move the microscope or change eyepieces (rarely) or photo-eyepiece (occasionally) I always to a focus test. But if I don't change anything it has remained parfocal. Steve... the link to www.amateurmicroscopy.net hasn't been working the last day or two .... Tom??? For some reason the domain names for amateurmicroscopy.net and reasonableexpectations.com have not propagated to the new server yet. Sometimes it can take as long as 48 hrs but we are quickly coming up to that seadline. For the time being I created a subdomain on photomacrography.net for the other sites. If you want to visit amateurmicroscopy.net or have a link to the site, use this url: http://www.amateurmicroscopy.photomacrography.net. This will open the amateurmicroscopy website. Breaking it down for us is terrific, thanks Charles! I've bookmarked the article to read tomorrow. I'm but every little bit helps pleebs like me. Thanks Charles for taking the time to create this page. I have it bookmarked and know it will come in handy when I finally get my scope. taking a picture? How do you avoid this danger? Your question is certainly not a stupid one. I was initially concerned myself. My answer is based solely on my observations (not any empirical info) so take that into consideration. First, most microscopes that would allow you to view while taking a picture have a light split of about 15%/85% (eyepiece/camera) so the intensity is diminished greatly through the eyepieces. When the picture is taken, the flash does not "appear" bright at all. It is nothing at all like when someone takes a flash photograph of you, and you see "spots" for a minute or so. (I have never noticed even the slightest "after-effect" even after taking many pictures in quick succession). My eyes seem to be bothered more when I take pictures without the flash and need to turn the illumination up in order to get a decent shutter speed and a good 3200 degree K tungsten "color temperature". I was actually a little more concerned with possible UV levels, but my flashes seem to have fairly heavy UV filtration in the plastic covering the flash tube. It is also quite easy to add effective UV filtration if it were still a concern. As a photographer I've spent many hours over light boxes looking at slides and transparencies. This would occasionally, after some really lengthy "sessions", bother my eyes. I even incorporated UV filters under the plexiglass in the light box to be extra careful, and discussed it with my eye doctor, who did not see it as a problem. If I am fortunate enough to have a long microscope session with good subjects I may take 300-400 exposures (most of which are deleted later!) and I have never experienced the slightest discomfort. I realize that just because no discomfort it noted, it does not guarantee long term safety. But if you eliminate UV as a concern as mentioned (since you can't really "sense" it), then the other concern I have is light intensity, which you can sense. I'm pretty cautious about such things and I have not noticed anything that has aroused any concern at all. There are others folks on the forum using flash as well. Hopefully they will read this and contribute their experience and perceptions as well. You have made me a bit more curious, and I think I will use my flash meters to see if I can get some idea of the light levels obtained at the eyepieces. I suspect they will be quite low. Thank you very much for sharing all details! I will see how it works after I get a flash for myself. UV filter might be a good idea. I've never noticed anything unusual when using the flash. Since my camera is parfocal with my eyepieces (and pond critters move very fast), I am always looking in the eyepieces when the flash goes off. I don't remember ever seeing black spots or any other vision associated phenomena that you'd see looking at the sun (or a flash in your face as Charlie says). My 15x Nikon eyepieces are very relaxing to the eye, and my eyes are never tired or sore after flashing them at least 100 times during a session. It's my back that hurts when I sit there that long!!! Once I flashed that Vivitar 283 at full power directly into my eyes at about 6 inches distance when I was first goofing around with it--that left a mark!! I saw black for 15 minutes! But through the microscope, it is harder on the eyes to watch the flash's reflection from the wall than through the eyepieces. Is there UV? Don't know, and as Charlie pointed out, plastics are great UV blockers and that's what is no doubt on the flash lens itself. I can't be quantitative about it, but it sounds like Charlie has the instrumentation for this. Hi Piotr, I am using flash too and at first I was concerned that I might hurt my eyes if I was looking in the eyepieces at the same time as I tripped the flash. I solved this very simply by closing my eyes at the same moment as I tripped the flash - it worked very well indeed. However occasionally I forget to close my eyes and I was surprised that I didn't really see any intense light. The flash itself, situated down by the lamp housing catches the periphery of my vision and this seems much stronger than anything coming up the tube. I miss you hanging around I just made a few exposures with my flash setup on my microscope and, quite frankly, I didn't even notice the flash until you brought it up. In my opinion, the UV light given off by office flourescent lighting and daylight poses a greater risk to your eyesight.